Waco, Tex. 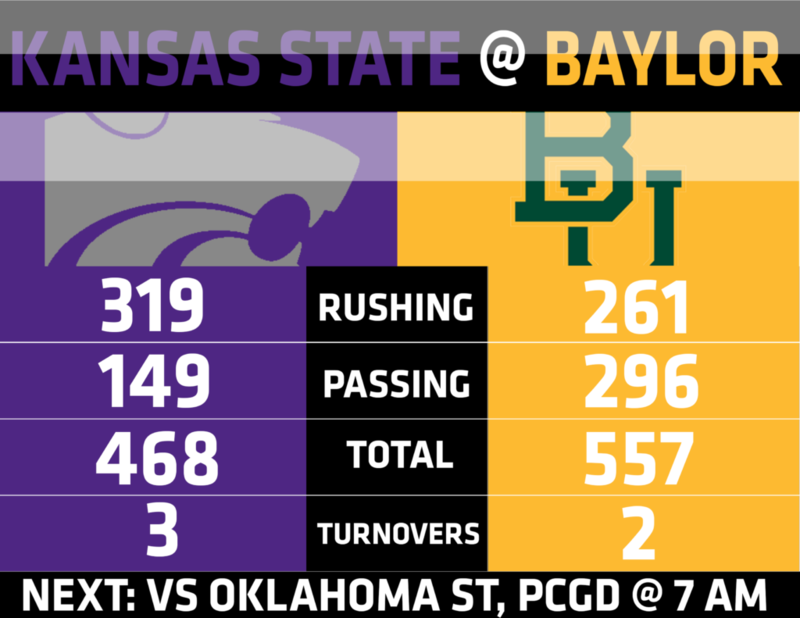 – After taking a step forward in last week’s second half against Texas, Kansas State appeared to take two steps back in Saturday’s game at Baylor. Baylor started the scoring with a Connor Martin field goal, which would be the most stress-free kick he would encounter. Just two minutes later, Alex Barnes found the endzone on a 55 yard touchdown run and Barnes was just beginning. Barnes would go on to finish the day with three touchdowns, but the three scores from Barnes would not be enough. K-State also got a rushing score on the ground from Skylar Thompson, who also threw for one score to Dalvin Warmack. With the offense having its best performance of the season, minus the three turnovers that Kansas State had, the defensive weakness shined even greater Saturday afternoon than any other point in the season. For Baylor, Charlie Brewer had a field day throwing the ball 44 times and completing 30 of those throws for 296 yards and a touchdown. Brewer did throw one interception when Duke Shelley of Kansas State made a diving grab. K-State would get another interception by Kendall Adams in the endzone after Baylor runningback Tristan Ebner attempted a halfback pass. Baylor had three rushers go for over 50 yards each with Ebner at 100 yards, JaMycal Hasty and Jalen Hurd at 60 and 56 respectively. K-State’s leading rusher was Alex Barnes with 250 yards, three scores and 22 carries. Barnes proved again that he loves running against Baylor, but it took more than just Barnes to keep K-State in the game. Bears kicker Connor Martin missed three field goal attempts throughout the game, but got the most important one to go with eight seconds remaining from 29 yards out for the victory. K-State had just scored with over four minutes left to play on a Thompson to Warmack pass. K-State trailing by three with eight seconds left saw a quick throw to Dalton Schoen to get them closer to midfield to try and give them a chance for a hail mary, but Thompson was not able to get enough space to get a throw off. Thompson struggled throughout the day finding some receivers, which led to a couple of interceptions by him. Alex Delton was out Saturday with an injury sustained earlier in the year. Up Next: Kansas State returns home to Bill Snyder Family Stadium to host the #25 Oklahoma State Cowboys. Oklahoma State lost in Stillwater on Saturday to Iowa State, 48-42. Oklahoma State is now 4-2 on the season. K-State is now 2-4 and winless in the Big 12.